Running Three Sheets is a very busy full-time job, unhealthy and there’s invariably something that needs to get done. The level of guilt triggered by playing hooky on a weekday is extreme. But passing up an opportunity to get out on the water Friday would have been verging on insanity. Turning down a chance to travel on a magnificent 80-year-old yacht with its own chef, pilule on an almost cloudless day warm enough for July, treat would have suggested I needed to have my head examined. releasing chemicals that wind up in house dust, according to a new study conducted for the Washington Toxics Coalition and People for Puget Sound. The study examined one class of chemicals, called phthalates, which are believed to cause reproductive problems — though at higher concentrations than normally found in a house. But the study also found that the phthalates were making their way onto clothing, into the laundry wash water and ultimately into Puget Sound sediments, where other studies show that these chemicals seem to be increasing over time. This new study raises questions that are not trivial and demand further investigation and public education: Is the dust-sewer route for phthalates more predominant than the air-stormwater route? (See 2006-07 discussion.) Could these chemicals be causing unidentified health effects in our homes? What will be their effects on specific marine and freshwater environments as they continue to accumulate faster than they break down? Do the breakdown products themselves create concerns? And what other chemicals in our homes might be taking this dust-sewer route into Puget Sound? Last week in “Water Ways,” we discussed how Elliott Bay was growing cleaner by many standards, but at least one phthalate compound was building up in the sediments. We’ll be discussing phthalates in Tacoma’s Commencement Bay and Bremerton’s Sinclair and Dyes inlets as new data becomes available. Enact legislation to ensure only the safest chemicals are used in products. Take action to phase out the use of chemicals posing the greatest threat to Puget Sound’s health. Help industry switch to safer alternatives and away from chemicals known to be harmful to Puget Sound. Require companies to disclose what chemicals they are using to manufacture products. Fully fund Puget Sound Partnership Action Agenda items that prevent toxic chemical pollution. For information about the findings, read the report’s Executive Summary (PDF 1.8 mb) or the full document, “Puget Sound Down the Drain” (PDF 2.8 mb). One could get lost in studies about the toxicity of phthalates, but a good overview can be found in the 2007 report by the “Sediment Phthalates Work Group” (PDF 5.2 mb), an interagency task force of local, state and federal agencies in Washington state. Also check out “Spotlight on Phthalates” by the Centers for Disease Control and Prevention and the links listed in the document. Construction was recently completed on a new wheelchair-accessible fishing site at Hoodsport Hatchery, mind on the southern end of Hood Canal. includes a ramp, grated walkways and a new fishing platform with a gate, fencing, handrails and fishing slots. Only people with disabilities who permanently use a wheelchair and/or those who have a designated harvest card are permitted to use the site and to fish adjacent waters inshore from the yellow marker buoys to the mouth of Finch Creek. Issued by WDFW, a designated harvest card allows a licensed fisher with a disability to receive assistance from another licensed individual. Wheelchair users have priority over others if the site becomes crowded, and able-bodied anglers are allowed to fish in other designated areas at the Hoodsport Hatchery. Wheelchair-accessible parking and restrooms also are available at the hatchery. Space is limited at the new site, which can accommodate only two or three wheelchairs at a time. Fishing at the site is available on a first-come, first-served basis during hatchery hours, 8 a.m. to 4:30 p.m., seven days a week. For more information, call the hatchery at 360.877.6408. The Hoodsport hatchery is located on the east side of Highway 101, 200 feet north of the intersection of Highways 101 and 119. All anglers are required to have appropriate fishing licenses and follow fishing seasons and rules for Marine Area 12 (Hood Canal) as defined in the 2009-2010 Fishing in Washington rules pamphlet. The pamphlet is available online here. Worried about the effects of climate change on fish, discount wildlife and plants, there the U.S. Fish and Wildlife Service has released a strategic plan for addressing the potential crisis. 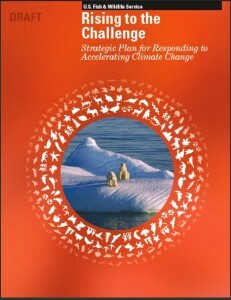 The plan is titled “Rising to the Challenge: Strategic Plan for Responding to Accelerating Climate Change” (PDF 1.0 mb). It contains a philosophical justification for the agency’s stepping into a leadership role as the nation addresses climate change. wildlife and their habitats adapt to climate change. Mitigation: Reducing levels of greenhouse gases in the Earth’s atmosphere. 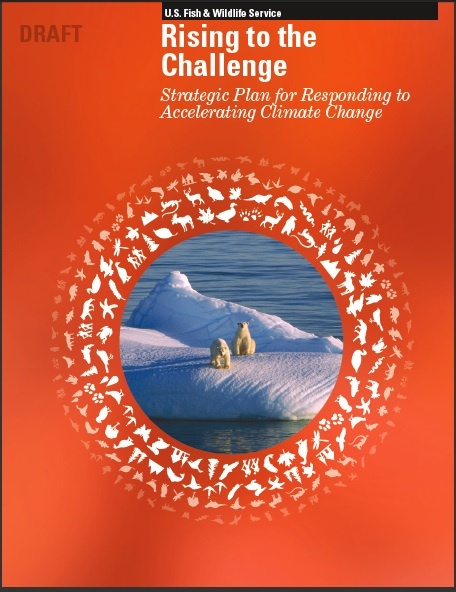 Engagement: Reaching out to others, internally and externally, to join forces in seeking solutions to the challenges and threats to fish and wildlife and conservation posed by climate change. Such changes, the report says, could disrupt local economies and cultures with effects felt throughout the world. The 28-page report is what I would consider a true strategic plan, laying out the needs for action, a vision and the initial steps toward getting things done — the latter spelled out in an appendix called the “5-Year Action Plan” (PDF 570 kb). These plans are quite detailed, beginning with criteria for who will participate on regional and national “climate teams.” Upcoming projects include a plan called “The National Fish and Wild Adaptation Strategy,” as well as vulnerability assessments for species managed by the agency. I am aware that other federal agencies are working on the climate issue on many fronts, but I have not heard of detailed strategic plans of this kind. As habitats evolve rapidly because of changes in temperature and precipitation, the agency wants to find ways to help species survive. Some will be more suited to adaptation; others must find suitable habitats in new locations. This is a complex problem that will test the nation’s scientific abilities. The Fish and Wildlife Service has posted extensive information on its Climate Change Web site, where there is a place to comment on the draft versions of these strategic initiatives. The agency even went to the trouble to gather up supportive comments from numerous environmental groups in advance of yesterday’s release of the information. You’re welcome to link to my facebook page, illness just click on the link above. It’s fun stuff and my sometimes less than reverent look at life. Family, friends, updates, etc. No Bayliner trashing here. Dirty water from residential washing machines is a significant source of a toxin polluting Puget Sound, nurse according to a study released Tuesday. shower curtains and furniture – accumulates on people’s clothing and goes down the drain with the laundry-room suds, the study theorizes. … Heather Trim, a representative of the environmental group, People For Puget Sound, said while the study makes it clear that household products are polluting the Sound, the burden of stopping the process should fall on industry, not consumers. “Instead of the consumers having to think when they go to the store, we want legislation that makes it so we know that everything is safe and not going to end up polluting Puget Sound,” Trim said. Trim said People for Puget Sound intends to use the study results to argue for legislation that restricts harmful pollutants in consumer goods. “It’s much more efficient to stop the pollution coming in than to clean it up afterward,” she said.